A melting pot that is cool to the touch AND magically turns your chocolate chips or chunks into velvety swirls of perfectly smooth, melted chocolate? It’s not a dream! 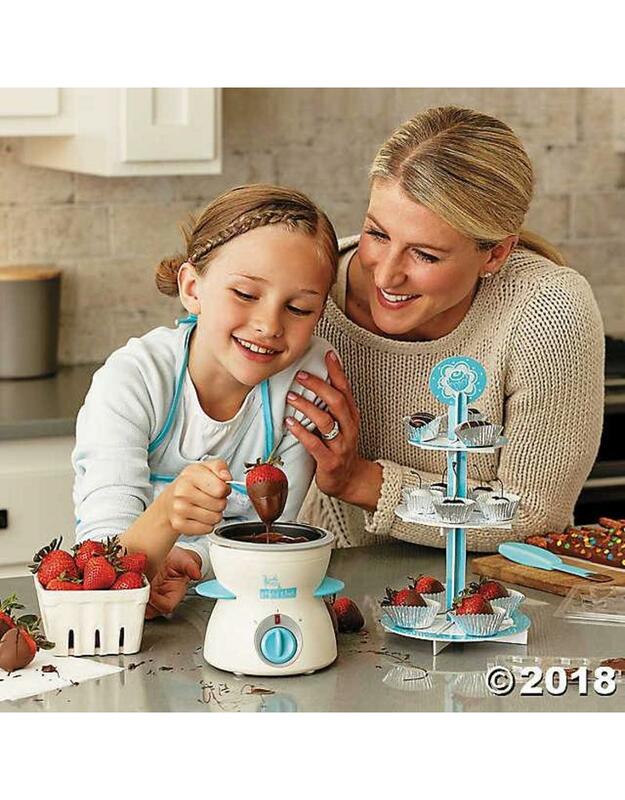 Featuring child safe temperature settings and a silicone lip, the Playful Chef Chocolate Studio will make sweet, successful memories for young chocolatiers. Make, display and design your own candy gifts and dipped treats with the Playful Chef: Chocolate Shoppe. The Chocolate Shoppe includes everything you need to create a beautiful candy display, showcasing your confections and treats. Kit includes an adorable mini-tiered stand – sized perfectly for chocolates and treats, and foil cups, foil wrappers and treat boxes for packaging your sweets. All contents are perfectly sized to display treats like chocolate dipped fruit, molded chocolate candy, chocolate bon-bons, truffles and any other sweet treat your heart desires. The mini treat boxes are great for personalizing and giving as gifts! Start creating chocolate treats right away with 1lb of dipping milk chocolate melts included in this set.